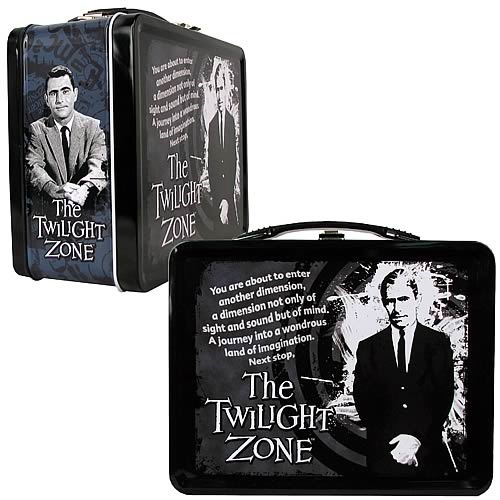 Shopping for Twilight Zone Lunch Boxes? Fantastic Rod Serling Tin Tote! Based on Rod Serling's enduring The Twilight Zone TV series. Features series-specific black-and-white artwork and a famous quote. It's a terrific collectible that makes a great gift for Twilight Zone fans! Entertainment Earth Comic-Con Debut! Bif Bang Pow! 's wonderful line based on Rod Serling's iconic The Twilight Zone TV series continues with this fantastic Rod Serling Tin Tote! Featuring series-specific black-and-white artwork that includes the show's creator himself, it also highlights a famous quote any fan will instantly recognize. The metal lunch box measures 8 5/8-inches wide x 6 3/4-inches tall x 4-inches deep. It's a terrific collectible that makes a great gift for any Twilight Zone admirer! Limited edition of 1,500 pieces.